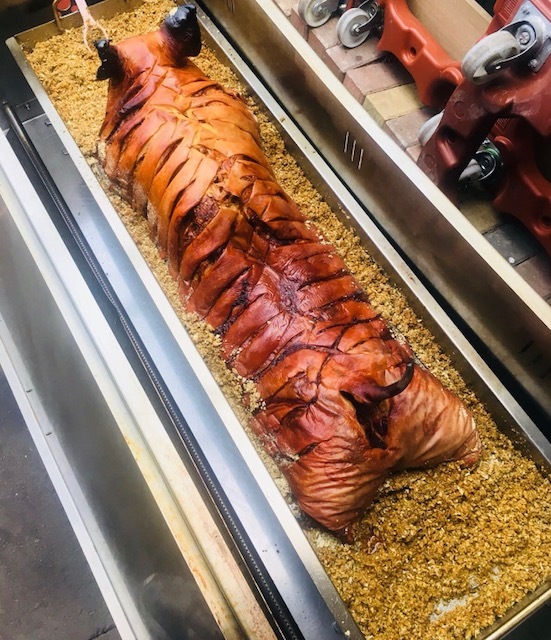 The Hog Roast Elgin team had the opportunity to get back to our medieval roots last week when we were asked to cater for a local Armoury Museum’s annual jousting tournament! It was pointed out to our terribly excited chef that he wouldn’t actually be able to take part and the only implement he would be allowed to brandish would be his trusty carving knife, but he couldn’t wait to see it all the same! It is always a very popular event and the crowds flock to see the trained professionals putting on an impressive display. We were informed by Chris, the museum’s Events Manager, that what wasn’t quite so impressive last year, was the catering! Apparently, the company he had hired had been a complete disaster from start to finish and had even run out of food! Chris was worried the negative feedback he received from the spectators, who had paid good money to enjoy the show and the food provided, might put people off coming back again this year. Chris knew he had to provide something extra special to win them all over again and after learning from his mistake he had done his research more carefully this year. He was certain after speaking to one of our well-informed advisors that Hog Roast Elgin wouldn’t let him down and would help him get ticket sales back up to where they should be! We assured Chris that we plan our events very carefully, are highly experienced in catering for big crowds and of course, we never ever run out of food (perish the thought!). One of our fantastic hog roasts prepared using this most traditional of cooking methods, is always the ideal accompaniment to any historical -themed event and the jousting tournament was no exception! We were carving our perfectly cooked pork as battle commenced and as lances were clashing and helmets were being rattled (within the limits of health and safety regulations of course! ), our classic pork butties were going down a treat with the spectators! Chris, who had been hovering nervously at the start of the proceedings, came over to us with a massive smile on his face! He thanked Hog Roast Elgin for undoing the damage caused by last year’s catastrophic caterers and for providing such fitting food for the medieval theme!